The problem with a concept like Content is King is it over simplifies how search engines (Google) works. It’s like saying you can make cake with an egg and nothing else! If true it would suggest great content will rise to the top of Google just because it’s great content: no need for any of the other SEO factors, remember in 2018 Google uses hundreds of SEO ranking factors. You can easily find SEO and marketing articles using the phrase Content is King to mean (or at least suggest) the most important Google ranking factor is content. Of course content is very important for gaining organic search engine traffic, but on it’s own it won’t count for very much, just like in chess the King is useless without the Queen etc… Chess is a good analogy, without moving the King a good player could still dominate a game of chess, but would be far harder to win if a player couldn’t move the Queen and half the Pawns were missing. Creating brilliant content won’t by itself generate masses of organic search engine traffic, but it will help. 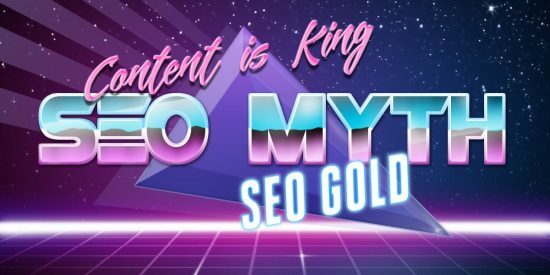 Take this article, I’m not only going to explain why Content is King is an SEO Myth, but I’m also going to teach the reader (you) some valuable SEO techniques: I hope you’ll consider this great content and will link to it from your blog or share it on social media. I’m also going to look at a few of the top 10 webpages ranked in Google for the phrase “Content is King” to see if they are indeed great content. You can see in the screenshot above the webpage https://www.silkstream.net/blog/2014/07/content-is-king-bill-gates-1996.html is currently (February 5th 2018) ranked number 1 in Google. If it’s ranked high just because of the content you would expect it to be awesome content. The article is titled “Content is King – Bill Gates, 1996” and references a Bill Gates essay from 1996 which used to be on the Microsoft website. It takes little quotes from the Bill Gates article and builds an argument around them that content is important in marketing: nothing wrong with this approach, I found myself nodding along as I read it (I agreed with most of it), but I don’t think it’s great content. Do you? As I create this content (text and images) I’m search engine optimising as I go along, I’m not leaving it to chance. I’m targeting SERPs related to “SEO Myths”, “SEO Content” and the main phrase “Content is King”, I’ll also try to link to other related content on the site like linking to other SEO Myths. I’ll use those and related phrases within the text and as part of image file names, image alt text, anchor text of links etc… This is basic onsite SEO copyrighting and the trick is to optimise the content without ruining it: don’t go SPAMMY. If you are relatively new to SEO the above paragraph introduces several important SEO concepts. 1. Use the phrases you want to rank for within the content: it’s obvious if you want a webpage to rank for the phrase “SEO Content”, use the phrase “SEO Content” in the content, but many content creators don’t do this! 2. Use the target phrases in image-file-names.jpg, separating keywords with hyphens i.e. google-serp-for-content-is-king.jpg: Google parses this file to “google serp for content is king” which includes a targeted phrase. 3. Use phrases within image alt text, for example alt=”Google SERP for Content is King” is the alt text for the image above which includes a targeted phrase. 4. Link to related content: this article is about an SEO Myth, one of the earlier links is to another SEO Myth and the anchor text is SEO Myth: SEO copyrighting isn’t rocket science, most of it is very easy to understand and perform. As you can see content search engine optimisation (SEO copyrighting) isn’t a simple case of create great content and hope for the best. Google isn’t a subjective person, it can’t easily judge what great content is so relies on other clues in the content it analyses, the quality of the domain the content is on and of course backlinks. How Important is SEO Copyrighting? Many highly ranked webpages are ranked high despite a lack of onsite optimisation. Google uses hundreds of SEO ranking factors which means there isn’t one single overriding SEO factor to rank high, it’s a combination of dozens of important SEO factors and many more minor factors. 5+ years ago just having masses of backlinks with keyword rich anchor text was enough to dominate a SERP. The Computer SERP used to be a great example, one of the top 10 in Google didn’t even use the word Computer(s) in the content and ranked high due to it’s backlinks using the keywords Computer(s) in the links anchor text. With so many Google ranking factors (hundreds) there’s no longer one or two factors (like backlinks with keyword rich anchor text) to drive a specific webpages rankings. 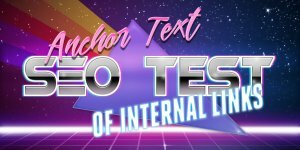 Even so you can still show with simple SEO tests the power of using keyword rich anchor text and keyword rich alt text of linked images. The ‘old’ SEO factors are still important, but their SEO value has decreased as Google added more ranking factors. Let’s have a look at another webpage ranked top 10 in Google for the Content is King SERP. Why Content is King or is it? 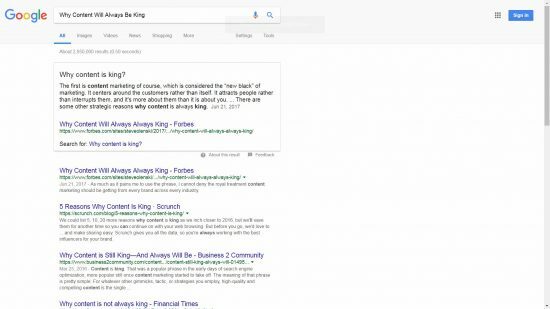 Ranked number 2 in Google for the content is King SERP is the webpage https://www.forbes.com/sites/steveolenski/2017/06/21/why-content-will-always-always-king/. This is a really good example of relatively low quality content (it’s not awful, but it’s far from great content) ranking high because of the main domains authority: it’s on the Forbes website. The first thing to notice is the title tag of the article “Why Content Will Always Always King”, what on Earth is that meant to mean? Clearly the author has made a mistake and either hasn’t noticed he wrote “Always Always” instead of “Always BE” (“Why Content Will Always Be King”) or hasn’t bothered to fix the title tag! Well Duh! Imagine what trains would be like if no one used trains, the trains would be empty, seriously! This is simply padding the article with keywords that could generate traffic: specifically the list of social media networks “Facebook, Twitter, LinkedIn, and Snapchat”. It’s a low level SEO SPAM technique to cram in extra long-tail keyword phrases to potentially rank for: it can work, my article could benefit from the above text. Not sure what a “recruit team” is, guess he meant recruitment teams. This webpage ranks primarily because it’s on the Forbes website, the webpage itself is poorly written and poorly optimised, but gets a huge ranking boost as Forbes is a trustworthy source of content, it has authority. 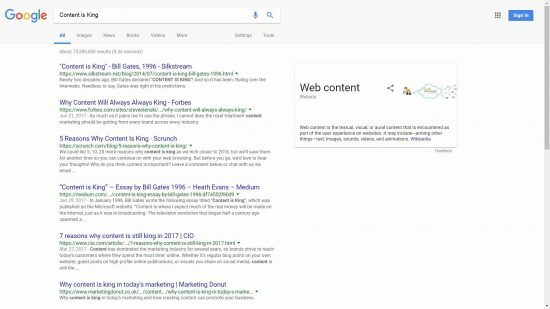 The Forbes article even gets a highlighted box (Google Featured Snippet) if you search Google for Why Content Will Always Be King suggesting you search for “Why Content is King”. I’m afraid the quality of content per se has little relationship to actual Google rankings, good quality content tends to rank better than low quality, but there’s no hard rule. High quality content does NOT equal high Google rankings. Low quality content does NOT equal poor Google rankings. Google uses so many ranking factors in 2018 no one factor is king, not many years ago you could make a strong argument for backlinks and anchor text are king, but today no one SEO factor alone will gain a SERP. Pretty much means the best SEO advice is try to get as many SEO ranking factors right so your content has the best chance possible of ranking high in Google. Best thing about great content is other webmasters are more likely to link to it (backlinks are a ranking factor) and visitors generally might share it on social media: if lucky a good bit of content can go viral generating a lot of social media traffic and some of those visitors might link to your content on their website.